Natalie attends Weston CI and loves many things, namely Star Wars. Tirthesha Pandya, a grade twelve International Baccalaureate student at Weston Collegiate Institute and recipient of Volunteer Toronto’s 2016 Legacy Award. The Legacy Award, presented annually by Volunteer Toronto during National Volunteer Week, is a highly competitive award bestowed upon 25 individuals of any age who have demonstrated a high calibre of community involvement, leadership, and philanthropic passion within Toronto. Thus, it is no surprise that Weston Collegiate Institute’s Tirthesha Pandya would be one of the few recipients from a plethora of over 200 nominations. Chosen by a selection committee of various community leaders, past recipients, and Volunteer Toronto board members, Pandya, a grade twelve student at Weston Collegiate Institute, was given the Toronto Legacy Award this past April. Though successfully navigating through high school is often a feat in itself, Pandya makes balancing copious amounts of extracurriculars and volunteering hours with the daunting syllabus of the International Baccalaureate program look nearly effortless. This commitment to a busy schedule of altruism and academics did not go overlooked as she now carries the title of one of Toronto’s many ‘secret superheroes‘. Pandya first began her notable volunteer work upon joining the Ontario Lung Association in the eighth grade. Driven by a personal and cultural attachment to anti-smoking, she participated in numerous protests and presentations advocating for restrictive laws on the tobacco industry and the negative influence of smoking on youth. Her dynamic participation within the organization eventually allowed Pandya to write and present her own deputation to Members of Parliament at Queen’s Park in support of Bill 45, a bill that bans nearly all flavours of tobacco products while strictly monitoring the sale and supply of e-cigarettes, thus eliminating the appeal of tobacco products to youth. Her efforts proved fruitful; Bill 45 was passed January 2016. Additionally, Pandya joined the City Youth Council of Toronto (CYCTO), where she was elected as Vice Chair for two consecutive years and now stands as a Youth Councillor for Ward 11, and the Youth Advocacy Training Institute (YATI), an interactive youth program branching from the Ontario Lung Association. Equipped with her knowledge from YATI and CYCTO’s networking opportunities in tandem, Pandya currently works to design an effective presentation on the tobacco industry’s impact on youth to be easily distributed and reiterated at schools across the TDSB. When not attending summits at Parliament Hill, Pandya finds herself in basketball shorts and cross trainers, stomping the Weston Collegiate Institute sports scene. Whilst being a solid member of the girls basketball and volleyball team for four years, she dabbles to-and-fro ultimate frisbee, rugby, badminton, and soccer, and collects shiny mementos at every athletic banquet to immortalize her natural athleticism, including Rookie to Senior Athlete of the Year, the West Region Optimist Award, and the OFSAA Colin Hood Award. She is an active member of the SAGE Business Club, Future Aces, and Weston Ambassadors, and a second-year International Baccalaureate student. However, this mélange of academic, athletic, and extracurricular success did not spontaneously manifest itself within Pandya. She describes her unexpected placement in the senior girls basketball team, despite being a freshmen, as her initial confidence-building moment that would allow her to transform into an active WCI student. This sudden immersion into foreign territory at the hands of her coach, Chris Reid, forced Pandya to embrace a sense of confidence that would accompany her throughout high school. Though initially dwarfed with sporadic playtime among a well-established group of senior girls, Reid called her to court for the most crucial game of the season — city championships. Her juvenile status was immediately forgotten as her playtime allowed the girls to return home boasting the title of city wide champions. Pandya also attributes much of her support to her sister, Kartiki Pandya, Jessica Diener of YATI, and her parents who been always there to remind her to ‘eat and do homework’ throughout her hectic agenda. “[Jessica has given] me so many opportunities … like the deputation. She chose me to make it. It really opened my eyes about myself and how much I could do to help the community,” she says fondly. A determined, well-rounded, and ambitious changemaker with the ability to manipulate her many talents to enhance the quality, rather than quantity, of her volunteer work; Tirthesha Pandya undoubtedly fits the mould for a Legacy Award recipient albeit young. Adept with time management, she skillfully allocates her priorities in order to balance a lifestyle of countless essays, chats with MP’s, and rugby tournaments. Her contagious positivity trails behind her wherever she goes, be it Parliament Hill or WCI hallways. Rather than marking the end of a chapter, receiving Volunteer Toronto’s 2016 Legacy Award among a party of middle-aged recipients only further inspires Pandya to continue her public-spirited endeavors, particularly with the City Youth Council of Toronto as she enters her first year at Schulich. A dog was found by Elm Park on the evening of March 18. Please contact (647)-870-2817 if this is your dog or if know the owner. Edit: The dog’s owner has been in contact with the number above. The previous proposal of accommodating incoming Syrian refugees in the currently unused Humber River hospital, specifically Weston’s Church site, have been denied. It is unclear whether sites such as Humber River Hospital will still be needed to accommodate refugees. However, the Salvation Army will be providing clothing, toys and furniture to refugees in addition to other communities in need and would no doubt greatly appreciate [any] offer of assistance. You mad find more information at: http://thriftstore.ca/central-ontario/ways-give. If you wish to volunteer or get involved in other initiatives, please visit www. ontario.ca/syrianrefugees. After contacting Laura Albanese about the idea, it has been further clarified that the hospitals will not serve as housing for any refugees entering Ontario. We have been informed that the Humber River Hospital (Church site) will likely not be used to house the refugees. Camp Tamakwa, Algonquin Park. Photo by Harshita Annapareddy. 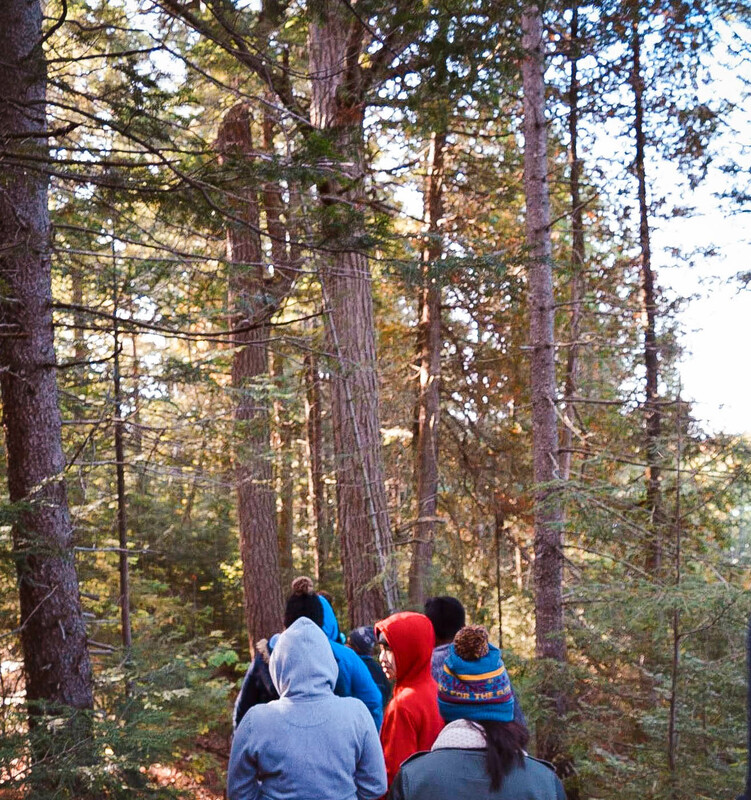 The IB program at WCI had been popular for offering their incoming grade nines and graduating students a trip to Algonquin Park, often acting as an incentive to battling the program’s enhanced curriculum. The idea of a four-day getaway to build friendships over s’mores and canoe sessions while surrounded by beautiful late-September scenery speaks for itself, and often produces fruitful results: the new IB students instantly become more comfortable, and the graduates spend these nostalgic four days around Tea Lake before diving into an intense final year. Yet, why just the IB students? A ground-breaking opportunity like Tamakwa should not be restricted to strictly one classification of students. As of 2015, change had finally arrived. This year, Weston’s IB director, Ms. Dale, and Guidance Counsellor, Ms. Galanis, with collaboration of many other teachers, successfully opened up the annual Tamakwa trip to all grade nines, inviting every student regardless of their educational background. The newly proposed Tamakwa accumulated just over one hundred grade nine students. This large combination of IB’s and non-IB’s seemed to introduce a daunting new task of removing boundaries between the two, but once the campers stepped off the boat ride onto the camp site, they became a cohesive, relaxed mixture where no one cared to identify each other’s programs. Activities included canoeing, hiking, and rock-climbing among others. To replace the traditional skits that each team was to create and act out at the final night’s talent show, a mandatory lip-dub to a song of their choice was showcased instead – needless to say, hilarity ensued. Team-building and leadership activities, and mentoring from the grade twelves were also included in the program. Mr. Botnick, Weston’s new principal, and Ms. Aloisie, a vice principal, even made a guest appearance to spend the day participating in the camp activities. 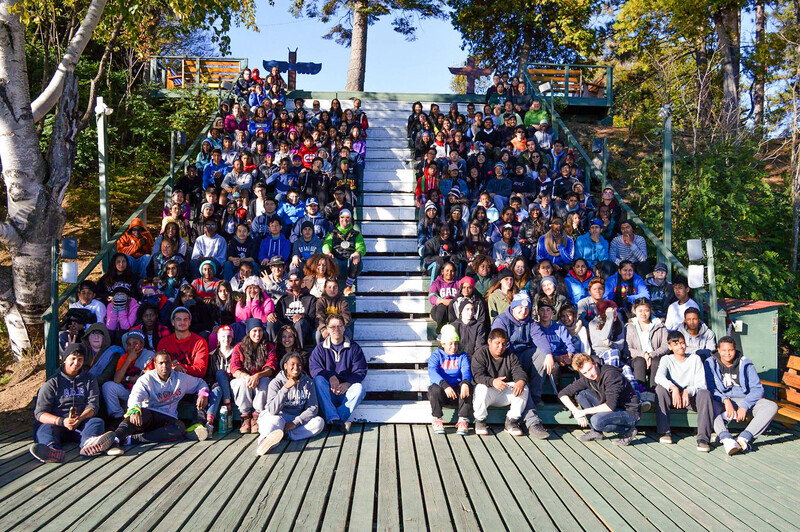 After the four days, new friendships were formed and the grade nines were at ease, having carefree conversations and laughing loudly with both the seniors and each other. However, tackling the new change proved to be difficult, particularly the pre-trip preparation. The IB students were well-rooted in the tradition of the Tamakwa trip – a stark contrast to the non-IB’s whom were new to this tradition. During those presentations, the grade nines responded more openly, asking questions, and as the grade twelves rolled on nostalgically about their own grade nine memories, the interest in the room visibly heightened. Once at Tamakwa, the previous lack of enthusiasm and various worries immediately vanished. Heeho Ryu, another grade twelve, recalls, “Before going into Tamakwa, the grade twelves all sort of had worried that the grade nines would find Tamakwa boring and not participate. However, the moment the wheels on the bus went round-and-round, I saw the grade nines, elevens, and twelves coming together, making jokes and sharing candy and chips. We all wanted to make Tamakwa a good experience for the grade nines, and so each individual became more understanding, enthusiastic, and dedicated. Evidently, this new progressive step forward will produce positive results within the student bodies for many years to come. This more cohesive student body will create a more motivating, supporting and accepting environment for these students to progress in, and for their future younger peers to experience as well. Laura Albanese, MPP for York South-Weston. 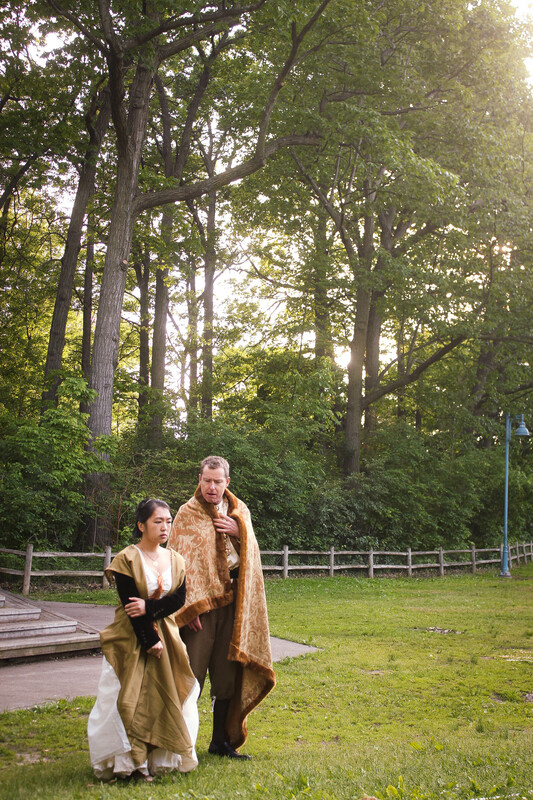 (Left to right) Olivia Jon (Ophelia) and Rob Glen (Polonius) in Hamlet at Kew Gardens. It isn’t often that the english teacher who helps you analyze Shakespeare’s soliloquies in class is also reciting them to an audience the same night. 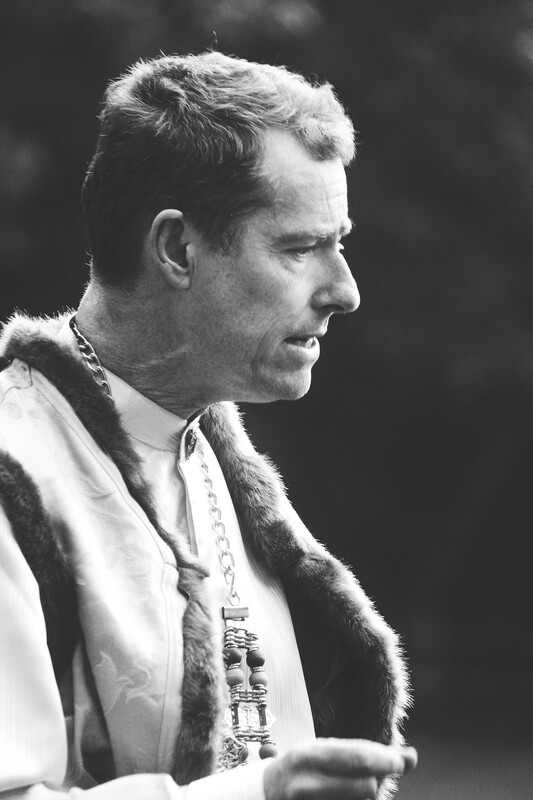 Weston Collegiate’s IB english and philosophy teacher, Rob Glen plays Polonius, a chief counsellor to the Danish royalty of Elsinore, in Shakespeare’s well known tragedy Hamlet. While delivering philosophical spiels about tabula rasa at the chalkboard, he can undoubtedly deliver powerful soliloquies at center stage. 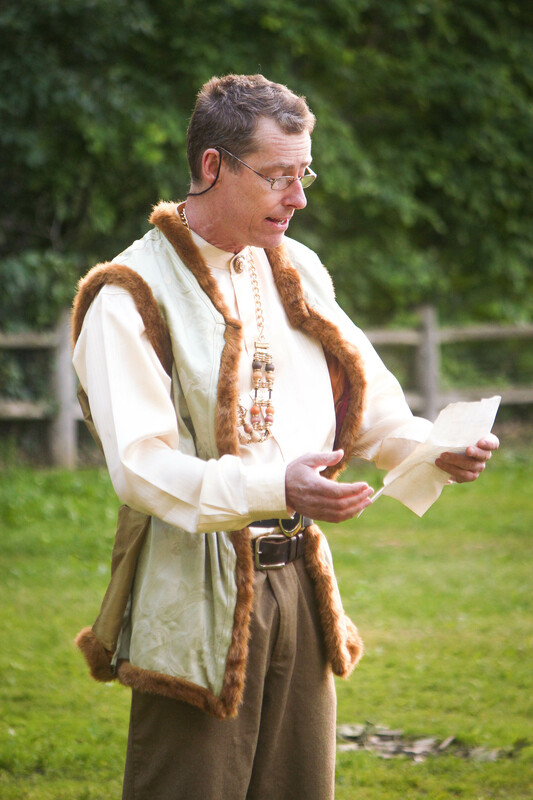 Glen is a member of two theatre companies; Stage Centre Productions and Bard in the Park, a volunteer-based company whose Shakespeare adaptations are performed every summer along the Toronto Beaches. Bard in the Park is currently showing a condensed two-hour version of Hamlet, as the tragedy’s five acts typically runs for four hours. The company will be performing at the Kew Gardens with evening shows at 7 PM from Tuesday to Saturday (June 16 – 20), and matinée shows running during the weekends at 2 PM (June 20 – 21). All shows are pay what you can. Polonius exposing Hamlet of his sappy love letters: the Shakespearean equivalent of your parents reading your texts. Yet, our Polonius had only joined the company quite recently. His acting career began after receiving numerous comments on his animated and comical behavior (which certainly sneaks itself into our philosophy lectures). When he wasn’t marking essays on Al Purdy’s poetic techniques, Glen enrolled himself in a few professional acting classes and began auditioning around various Toronto theatre companies. Five years ago, he scored his first role, and one of his favourites, with Stage Centre Productions as Freddy in George Bernard Shaw’s Pygmalion. From then on, his thespian opportunities skyrocketed. Taking an immediate liking to his skill, Garth Allen, the artistic director at the time, offered Glen more roles despite him being novice. With Allen, he played Gerald in JB Priestley’s An Inspector Calls, and Father March in Little Women. With a new artistic director, Michael Burgess (to which he adds, “not the singer, the other guy,”), Glen continued with Stage Centre Productions to play Bo Dekker in Bus Stop, an ageing detective-wannabee in The Game’s Afoot, and a German violinist with Nazi affiliations in Ronald Harwood’s Taking Sides. The same year, Taking Sides was remounted at Al Green Theatre in honor of Holocaust Awareness Week. In Stage Centre Production’s most recent show, Glen played Jonathan Brewster in Arsenic and Lace. His next role will be in Ken Ludwig’s Leading Ladies, a comedy involving cross-dressing and conning for money, coming March 2016. 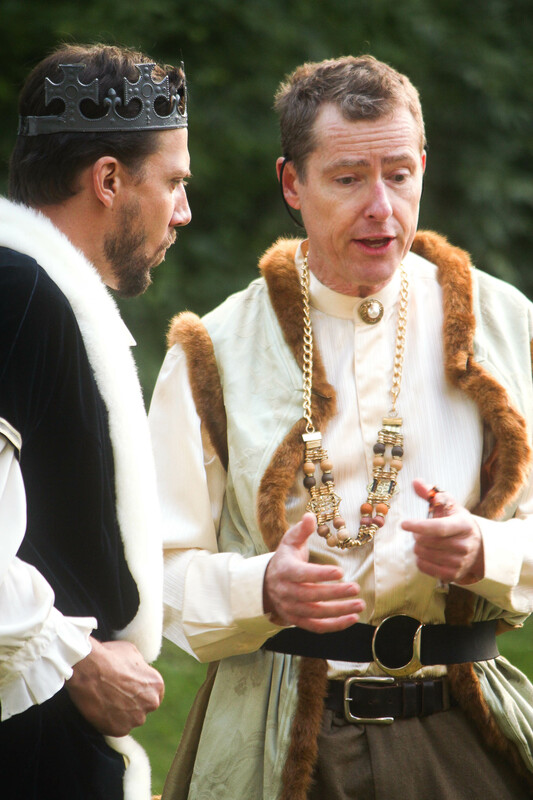 Joining Bard in the Park just two years ago, the company invited Glen back to embody Polonius after playing Lodovico in their previous production of Othello. Preparation for Hamlet began in January, where the cast of ten rehearsed two days a week for two and a half hours. (Left to right) Hom Bradwell (Claudius) and Rob Glen (Polonius) probably discussing how to figure out Hamlet’s level of sanity. While playing the loving father of Ophelia and Laertes, there’s a weasel-esque essence to Polonius that, if exhibited appropriately, can provide a comic relief to the play’s dark overtones. To see their interpretation of Polonius and celebrate an end to exams, I attended one of the evening shows at Kew Gardens. Sprawled over the park’s lawn on burlap sacks, we watched as Mr. Glen read aloud Hamlet’s teenage-sap-ridden love letter and plotted his conniving plans. His portrayal of the fishmonger and worm-like Polonius did indeed invoke laughter. One might assume that balancing teaching two separate subjects whilst acting in two separate companies is difficult. But Mr. Glen thinks otherwise: “It’s kind of like when you come back from a hard day at work, so you go out dancing. Then you discover you have this hidden reserve for special types of energy. Be sure to catch Rob Glen in Bard in the Park’s production of Hamlet this weekend, and Leading Ladies with Stage Centre Productions next March.